Our oil rubbed bronze vent cover will compliment any rooms' style with its rich and subtle coloring. Our metal floor register has a protective powder coating finish which helps to prevent corrosion and is made with durable 3mm thick steel. This oil rubbed bronze vent cover allows you control on how much airflow you let into your room since it comes with a steel, adjustable damper. Order this metal floor register today and experience the easy one step installation. Our oil rubbed bronze vent covers can also be wall or ceiling mounted, depending on the size. 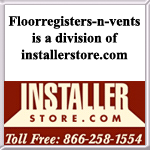 Tip: To order the correct oil rubbed bronze vent cover do not measure your current metal floor register. Instead you must measure the floor hole opening since a 2" x 10" register will fit into a 2" x 10" hole. These oil rubbed bronze vent covers are not just for the floor! The 2" and 4" wide metal floor register can only be wall mounted by using special wall mounting brackets which can be purchased separately. Need oil rubbed bronze vent covers for the ceiling? The 6" wide metal floor register have knock out screw holes so they can be ceiling mounting along with being used in the wall. Check out our video with instructions how to knock out the holes. Our metal floor registers come in a variety of different styles and finishes for every homes desire. It's time to order this oil rubbed bronze vent cover and redecorate your office and home today.